Utilizing an appropriate nutrient solution is one of the most important components of establishing and maintaining a hydroponic greenhouse tomato crop. In hydroponic production, all of the essential nutrients (Table 1) must be provided to the plant in solution form as the substrates typically used for tomato production have no nutritional component as would soil in field production. This fact sheet will provide a guideline to formulate nutrient solutions for successful hydroponic tomato production under a controlled environment. Table 1. Nutrients typically provided in a complete hydroponic nutrient solution. Macronutrients are those that the plant uses in relatively large quantities and micronutrients are used in very small quantities. Young plants require and should be provided with lower nutrient concentrations than mature plants, to prevent plants from becoming too vegetative. Plants in early fruiting stages require increased levels of specific nutrients like nitrogen (N), calcium (Ca), and potassium (K) because the developing fruits demand greater amounts of these nutrients. Mature fruiting plants require the highest levels of nutrients to promote plant growth and fruit development, as well as an appropriate balance of specific nutrients to ensure high fruit quality. Table 2 below describes the three stages of developmental phases we normally consider for a tomato fertilization program. This 3-stage system works for small to medium greenhouse growers. Some large commercial growers utilize an additional stage between the first two stages to even further optimize the fertilizer program (M. Jensen, personal communication). 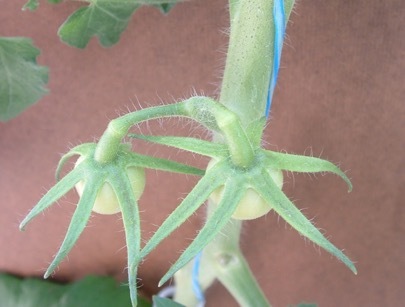 Regardless, tomato plant stages are defined by the number of visible flower trusses. Table 2. Developmental stages of tomato plants that are used to determine the type of nutrient solution used for that stage. Stages are based on number of flower trusses with open flowers. In young tomato plants (up to and including Stage 2), the primary concern is limiting the concentration of nitrogen (N) compared to the concentration used for mature plants. Too much N will cause the plants to be overly vegetative, resulting in thick stems, burly and curled leaves, and most importantly, reduced flowering (as truss in Figure 2 that had only two flowers resulting in only two fruit, when six to eight would be expected) and poor fruit quality of those fruits formed during overly vegetative growth. Other nutrients, like calcium (Ca) and potassium (K), are also reduced during this phase as they are not needed at high levels for this early growth, and using excessive Ca and K is an unnecessary expense. In later stage growth (Stage 2), N, K, and Ca are increased as the larger and rapidly growing plants has a greater N requirement, and the developing fruit require greater amounts of K and Ca to prevent abnormal development of fruit on the plant, but the amounts are not as high as for mature plants (Stage 3) that have more fruits and higher proportion of maturing fruits. In the mature stage (Stage 3), the plant is big enough and has a large enough fruit load that the maximum nutrient concentration can be applied. N is increased to promote plant growth and development, Ca is increased largely to prevent blossom end rot and K increased to promote fruit sugar loading and general fruit quality. Table 3 below describes a 3-phased nutrient solution developed by Dr. Merle Jensen at the University of Arizona that we have used to successfully grow hydroponic greenhouse tomatoes in various climates. Table 3 also shows a 4-phased nutrient solution developed by Dr. Jensen for commercial growers who require even greater control. Table 3. Nutrient concentrations of the multiple stages of 3-Stage and 4-Stage tomato nutrient solution (Jensen/UA-CEA) formulated by Dr. Merle Jensen of The University of Arizona. Values in mg/L (ppm). Off the shelf fertilizers for phased tomato nutrient solutions are typically not available and must be prepared by the grower. Although many growers prefer to use “single bag” or “two bag” preparations based on pre-mixed commercial fertilizers, with care and attention to detail, using the multiple components of a custom nutrient solution is not a burdensome procedure. We typically mix 12 to 13 different fertilizer salts to formulate nutrient stock solutions to dilute and use for plants. Some fertilizer companies offer custom mix fertilizers if you are using them in large quantities. Using a phased nutrient solution requires the preparation of those solutions using individual soluble fertilizer components. It is important to use genuinely soluble fertilizers as other fertilizers are often formulated for soil application and include additives that will compromise and “gunk up” your nutrient solutions. Soluble fertilizers are available from suppliers that cater to hydroponic growers but can also be obtained from bulk fertilizer suppliers as the manufacturers are often the same as for field applied fertilizers. These soluble fertilizers need to be stored in dry conditions, and storing in 5-gallon plastic buckets with sealable lids is a recommended way to help keep the fertilizers in good condition. Just make sure that the containers are well and accurately labelled. Table 4 below shows a preparation recipe for the three different stages of the target formulation (in Table 3), using commonly available soluble fertilizers. Depending on the quality of source water and the type and amount of acid for pH control, some further adjustment is needed to finalize the recipe. Table 3 is a standard recipe when no adjustment is needed, such as when using RO water. Table 4. Solution preparation recipes for commonly used soluble fertilizers for the 3-Stage Jensen/UA-CEA hydroponic nutrient solution. All amounts are for a 100X concentrated stock solution. The pH of the solution is an important factor that affects availability of nutrients. For hydroponic nutrient solutions, the range of pH where most nutrients are highly available is 5.5 to 6.5, and the drip (the nutrient solution added to the substrate which the plants are growing in) is usually managed to be in this range. The rootzone pH (the pH of the solution in the substrate) is more important than the pH of the drip, as the rootzone pH is what the plants are experiencing. The substrate, and the roots growing in it, can affect the pH. Plants at the different stages of growth will affect it differently and growers will adjust the pH of the drip to affect the pH of the rootzone. For example, rapidly growing plants can cause the pH to increase due to high NO3 uptake. If the pH of the rootzone is above 6.5, growers will adjust the pH of the drip to the lower end of the pH range to reduce the rootzone pH. In addition to adjusting rootzone pH, some feed water may have high enough pH that the solution pH will need to be adjusted by addition of acid. An additional injector to inject dilute acid solution is the simplest way to accomplish pH adjustment of nutrient solution. We typically use a fairly dilute acid stock solution (2 ml sulfuric acid per liter water). The electrical conductivity (EC) of the nutrient solution will be different for the different stages of nutrient solution. Stage 1 nutrient solution should have an EC of about 2.0 dS m-1, due to the lower overall nutrient concentration, and Stage 3 will have an EC closer to 2.4 dS m-1. These EC can be higher when the source water contains measurable amounts of salts. The use of too saline source water must be avoided or done following appropriate consultation. 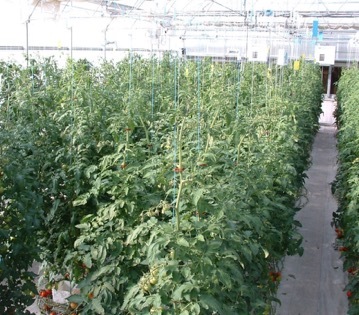 Using proper nutrient solutions for a greenhouse tomato crop is important to maximize the plant productivity. Accommodating the different nutrient requirements of the different plant growth stages is an important aspect of this. If a grower has a preferred mature stage (Stage 3) fertilizer formula, but does not have the capacity, or if availability of individual soluble fertilizers is too limited to feasibly create Stage 1 and 2 solutions, a practical solution to providing staged nutrient levels would be to use half-strength of that Stage 3 recipe for Stage 1 plants, and a three-quarter-strength for Stage 2 plants. Varying strengths can be achieved by adjusting the injection rate of the injectors. While not optimal compared to a specifically formulated Stage 1 and 2, preventing hyper-vegetative growth in Stage 1 and 2 plants is more important than doing nothing because creating optimal Stage solutions is impractical for the grower. Resh, H.M. 2012. Plant Nutrition, p. 9-30. In: Hydroponic Food Production. CRC Press.